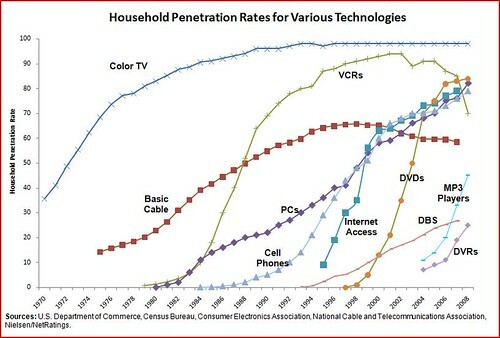 Regardless, no matter how you cut it, the more modern and the less regulated the technologies, the quicker they get to market. Here’s a couple of my recent charts illustrating that fact. 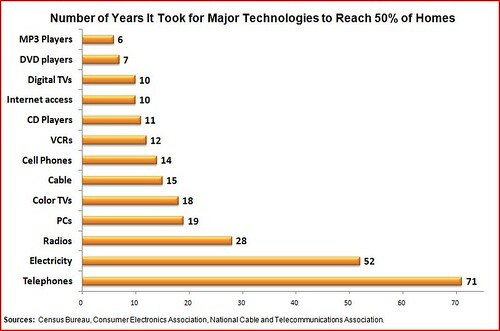 The first shows how long it took before various technologies reached 50% household penetration. The second illustrates the extent of household diffusion over time. One final point: Defining each category is getting increasingly difficult. What is “a color TV” today? Laptops and personal computers (PCs) are currently not counted as “color TVs” by the Consumer Electronics Association or the FCC, and yet millions of people are now watching TV on their PCs. But wait, what’s PC?! That too is becoming far more difficult to define. In sum, an age of convergence mucks up the measurement of such things. 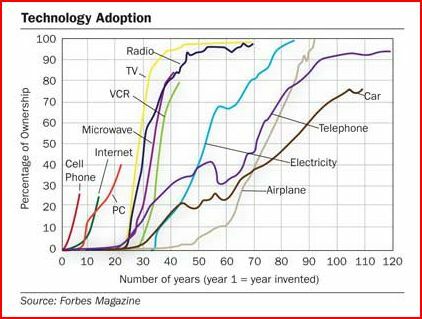 Oh well, the good news is, we’re getting a lot more gadgets delivered to us faster than ever before! God bless capitalism.